The University of Rome “Foro Italico”, an Italian state university excelling in the Sport Science studies, in consortium with the Norwegian School of Sport Science in Oslo (NOR), the University of Vienna (AUT), the University of Southern Denmark in Odense (DEN) and the German Sport University in Cologne (GER), leading European Universities in the field, offers a 2-year European Master in Health and Physical Activity (120 ECTS). The program is carried out in English and successful students will be awarded a joint European certificate plus single or double national second level degrees (that are equally valid in Italy as well as in the other European countries). 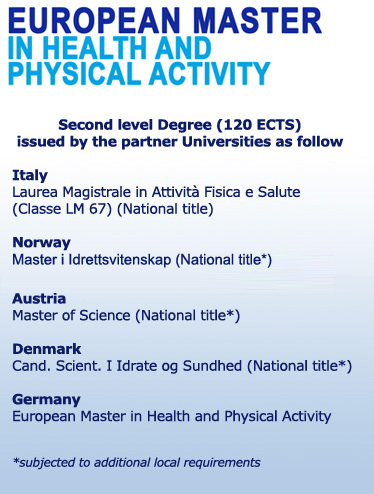 Graduates in the Sport Science area are eligible to enter the European Master in Health and Physical Activity: in this case they already meet minimum requirements and they have only to pass the entrance examination. Graduates in different degree courses, shall have earned at least 28 ECTS (12 ECTS in the biomedical area, 12 ECTS in Physical Education/Sport/Movement Science and Kinesiology area and 4 ECTS in the psychological – pedagogical sociological areas) in order to be admitted to the selection and, of course, to pass the entrance examination. Also those students who are going to graduate in the fall session are admitted to the entrance examination. However, their enrolment will be accepted on a provisional basis and will be confirmed only if the degree is obtained 30 November. You will need to fill out and get ready specific documentation (Application form, Curriculum), that can be downloaded from websites http://www.uniroma4.it and http://www.europeanmasterhpa.it/, where you can also find detailed information about entrance requirements and the program. These documents, in addition to the pre-enrolment procedure indicated in the official announcement, shall be received by the European Master Board by deadline (15 July 2016, at 13:00 CET) in compliance with the conditions published on the above mentioned websites. This entry was posted in Profiles and tagged Masters, Members, University of Rome. Bookmark the permalink.